To see Angela Jackson's amazing interior design work please visit her Houzz page. Ahh, trends---love them or hate them, follow them or don’t. The fact is that they drive manufacturing and therefore what you will have available to you for use in your home design. I don’t like saying something is “out” or “in” because if you truly love something it will always be “in” for you. But we can look at what the trends say homeowners are moving toward. With that in mind, here are five of my favorite things the experts are saying we should expect to see more of in 2018. Have you been feeling like your all-white kitchen is lacking something? Well, you are obviously not alone. This year, the number one trend that I’m seeing across the United States, and even across the pond, is a move toward color in the kitchen. While white kitchens are still popular, we are seeing a huge move toward adding color. I think this has something to do with the overall trend of homeowners looking for a hygge (pronounced HOO-GAH) or cozy feel in this uncertain world. Now, this doesn’t mean that kitchens will be moving back to the dark woods and Tuscan looks—those are apparently gone for a while. But it does mean that homeowners are asking for things that will help warm up the white, like colored islands and warm fixtures. Wood countertops on islands and adding wood beams to ceilings are also great ways to make the room feel less stark and more welcoming. Gone are the days where all your metal fixtures had to match! You can achieve a much more interesting look by mixing your metals in just the right way. The trend is going away from the more shiny metals and into the matte or aged-look ones, with black matte metal taking the lead now, especially in bathrooms and shower glass frames. My favorite examples of this are mixing matte black and matte brass in kitchens and bathrooms. But matte black still looks great with a slightly shiny brass too. According to Houzz, in 2018 we can expect a move toward using more dark-hued concrete, stone, copper, and granite composite sinks in place of the traditional white or stainless steel. 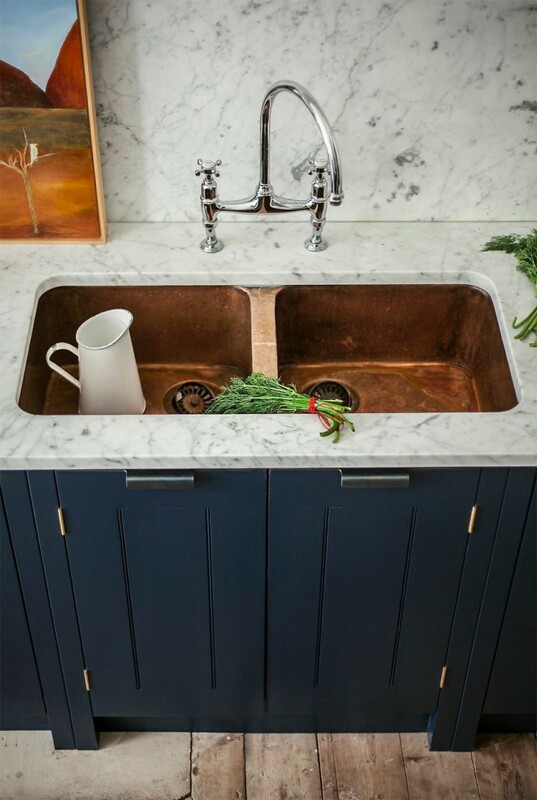 I especially love the way the warmth of the copper sink sets off the coolness of the Carrera marble in this photo. That mixed with the blue cabinets creates that warm yet modern vibe. Why go boring when you can wow with your floors? That seems to be what homeowners are thinking lately. Personally, as much as I love the look of a patterned floor like the one to the right, this is the one trend I would have trouble getting on board with for my home. It’s just so hard (and messy!) to rip out and replace a tile floor and I tend to change my décor often. But if this is your jam and you can live with it for a while, go for it! You will definitely get a huge design bang for your buck with this one. Again, homeowners are moving away from stark and toward interesting. 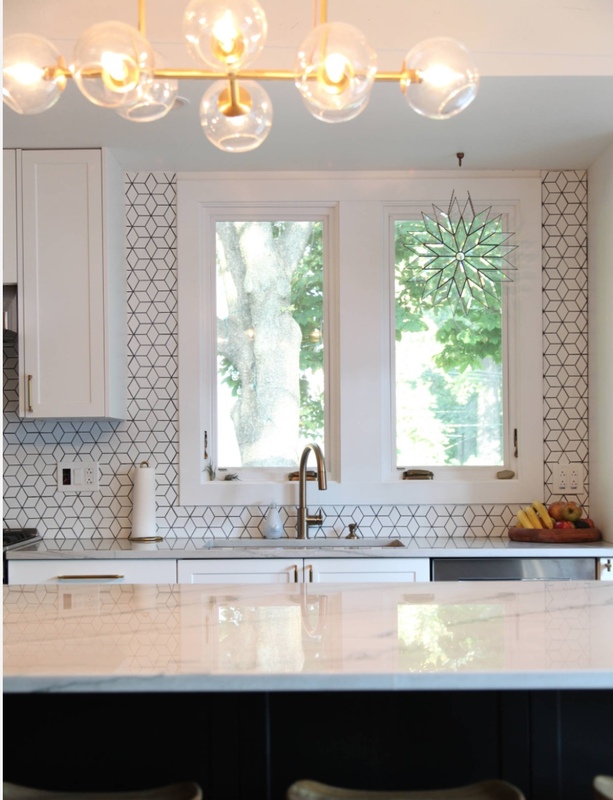 A fun and easy way to do this is using a pattern in your backsplash. This doesn’t mean you have to go crazy with color and pattern (although you certainly can!). Using white tile with an interesting shape can be just as impactful and less risky. I recently installed a white hexagonal tile with charcoal gray grout in a kitchen and it turned out beautifully. The kitchen featured to the left is a great example as well. And if you want more color and interest, this laundry room is perfection! That backsplash has just enough going on to draw you in, while the rest of the room is subtle enough to let it take center stage. So there you have it! These are my favorite trends for 2018 and the ones I think we'll see in this area the most. Overall, the trends in building and remodeling are echoing those we saw in the paint color trends-a move toward warmth and character in our materials, and in our homes in general. Stay tuned…my next post will feature design trends for décor. Spoiler alert-cozy and interesting are in! Older PostPUBLIC SCHOOLS… DO WE STAY OR DO WE GO?